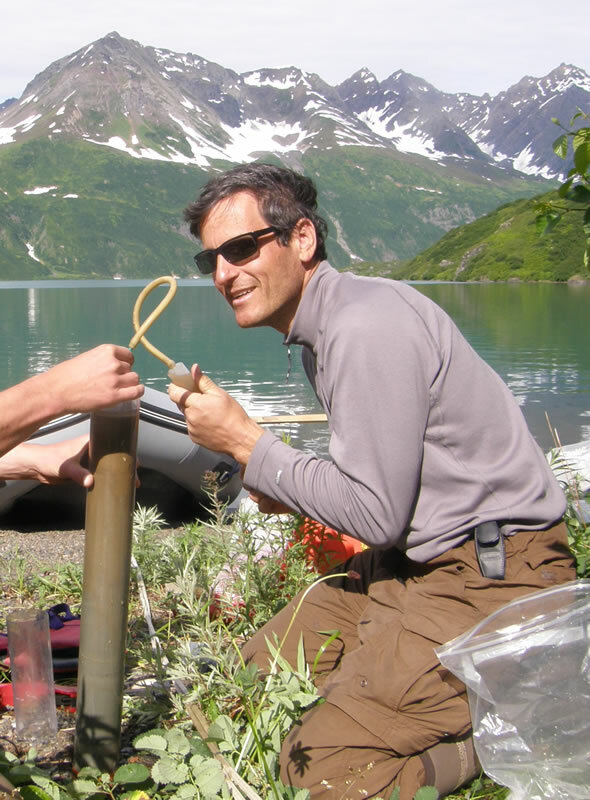 If all goes according to plan, Darrell Kaufman is coring lake sediments in southern Alaska. Of course, hardly anything ever goes according to plan. One of the busiest researchers we know, paleoclimatologist Darrell Kaufman from Northern Arizona University, has started a long research season with a truck and snowmachine trip in southeastern Alaska’s Copper River Valley. He travelled there earlier this week to core a couple of lakes around Cordova. After flying in to Anchorage a few days ago and picking up a truck with a trailer and two snowmachines, Kaufman and team drove down the gorgeous Richardson Highway to Valdez, and then travelled by ferry over to Cordova—or such was the plan. The Valdez area has received over five feet of snow in the past few days, but we suspect Kaufman’s team had already reached Cordova before the storm hit, and that all is proceeding roughly according to plan. Basing in Cordova, they will use snowmachines to travel to nearby lakes, still capped with winter ice—or so we hope. In this El Nino year, there’s been speculation that lake ice might be a bit thin. The plan is to set a small drilling rig on the frozen lake and then to bore a hole in the ice in which to deploy the sediment coring equipment. Cores harvested from the lake bottoms will be shipped to the Kaufman lab at NAU for analysis. Researchers will look for evidence in the sediments--tiny bugs, pollen spores, and dust, for example--that they can use to understand what climate was like when the particles drifted down to the lake bottom. As we mentioned, Kaufman is busy this year. He’s leading a giant international collaboration of scientists who are looking at lake cores to better understand how unusual events, say, large volcanic eruptions, can trigger abrupt changes in climate—and what those abrupt changes look like in the sediment record, as well as what types of climate phenomenon may follow. Understanding the “signatures” these events leave can help scientists improve the models we use to predict future climate. Kaufman will also work in the Brooks Range this summer with collaborator Jason Briner; and he’ll revisit Adak Island in the Aleutian chain and Allison Lake to collect more lake cores. We caught up with Kaufman to learn more about his work last fall. Click here to find out about lake core science—straight from Kaufman himself. We discovered this recent Kaufman article in the Arizona Republic, a statement about the so-called “Climategate” folly resulting from illegally-obtained emails.